Brass Knuckles and Are They Even Legal Anymore? 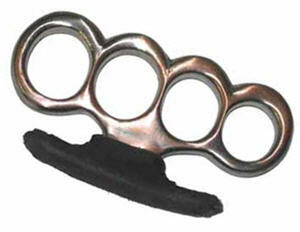 Brass knuckles are a hand combat weapon made popular by Mafia books, movies and video games. Although called brass, they are most often made of steel and iron. The newest types are made of pewter. We are not lawyers, but Brass, pewter, or carbon fiber, or any type of knuckle weapons are not legal in some states. Check your state laws for brass knuckle legality. You will find them for sale as belt buckles, paper weights, and other artist forms. They are slightly modified to potentially skirt the lwa. 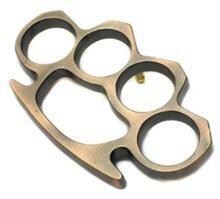 To be sure about a set of brass knuckles check your states laws because you don't want to be in a situation where you hurt someone or were found with a pair and pay a hefty fine, or go to jail. Brass tends to be too flimsy and corrodes easier. Brass knuckles are constructed to fit around that part of the fist. They can be effective in close range combat, leading to severe trauma and broken bones. The device concentrates the force of the punch into a smaller target area, thereby making it hurt a lot more. Hand weapons have been popular since ancient times. They were used in the Civil War by soldiers of both sides, who would fashion the knuckles out of melted bullets, or out of wood. They remained popular through both world wars, used by British and American soldiers alike. Some of the more detailed kinds had high rounded rings, or spikes where the rings met in the guard. These can be even more dangerous, and were considered collectors items back in their heyday. Now it is a bit harder to carry a set of knuckle weapons around legally, and the only military that still incorporates them is the Argentine Paratrooper Division. They are outlawed in many countries, including Canada, Germany, Great Britain, Sweden and Russia. There are stiff fines and jail time involved when someone is caught with these on their person. They are considered a very dangerous weapon by many countries and perhaps rightly so. If you live in France, brass knuckles are considered a legal weapon, much as a handgun is. Like a handgun, you are also required to be eighteen, and register to be able to carry them on your person. If you commit a crime with these in your possession, license or not, the penalties can be very severe. 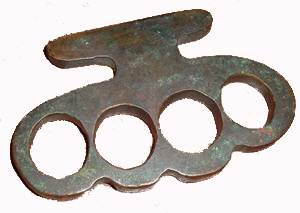 In the United States of America, brass or any style of knuckle weaponry is not illegal at the federal level of government. Citizens are allowed to own, and even carry them, but the problem with that is that most state and city governments have their own legislation in place against this dangerous hand weapon. In some states they are banned, in others you need a license to carry them. And still others have no laws at all on this subject. It is really quite troubling, considering how dangerous this weapon can be. Many swap meets and weapons shows will often have an extensive collection of brass, iron, steel, or carbon fiber knuckles on display somewhere. There are over millions of private collectors, and there are also many available on display in museums. Now they are more commonly made out of metal composites and hard plastics. So there really isn't very much brass in them brass knuckles anymore. As always it is important to remember a weapon is only as dangerous as the person who is holding it. If you don't want to hurt someone then don't. Be smart and you will be able to stay out of jail.